By hungry runner on August 4th, 2010 . Filed under: Blogs, Cupcake Ideas, Decorating . My mom’s birthday is a little less then two weeks away so I was trying to come up with a cupcake idea for her. 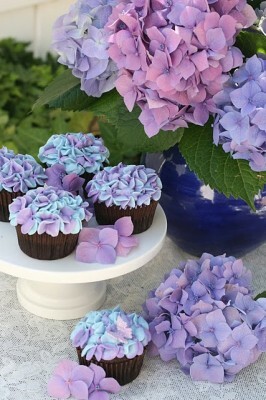 I came across these Hydrangea Cupcakes on Glorious Treats and think I have found what I’ll be making my mom! 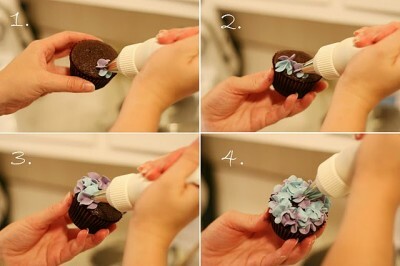 Below are Glory’s picture directions and step by step directions to follow to create these floral cupcakes. Glory made a batch of her favorite chocolate cupcakes (recipe HERE), and her vanilla cream cheese frosting (recipe HERE). Then colored half of the frosting blue, and half purple (mixing a few shades of blues and purples to get a good color match to the real hydrangeas). When making the frosting, use very little cream (less than 1 tablespoon), because the coloring will add some liquid, and you need the frosting to be pretty stiff to hold a nice shape. If you’d like to match other hydrangeas, you could certainly use other color options, like light blue and medium blue, or two shades of pink. But frosting these with two colors (instead of just one) really added to the effect. She filled her piping bag with the two colors of frosting, side by side. Once your bag is filled (1/2 to 2/3 full), you may want to just squeeze some frosting into a bowl, until you see both colors coming out. Oh wow, these look gorgeous, im sure they are as delicious as they look !! Beautiful! Look so real! What size tip did you use? Thank you, I’ve recently been searching for information about this subject for a long time and yours is the greatest I have came upon till now. However, what in regards to the bottom line? Are you positive about the supply?